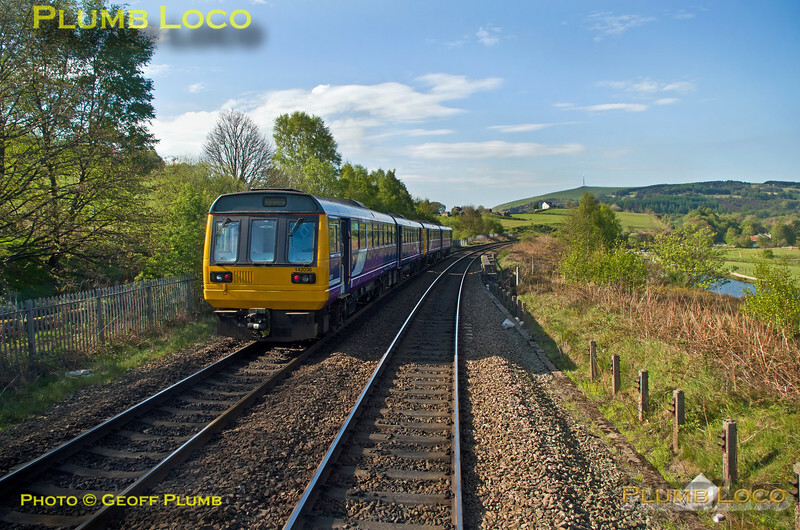 The BLS "Vallum Hadriani" tour was booked to traverse the Down Passenger Loop at Diggle but the signal controlling this move was wrongly set for the main line. The tour train stopped and the signaller at Diggle Junction Signal Box contacted, after which the signal returned to red and the route re-set after the time-out period for the signal, costing a few minutes on the schedule. Whilst at a stand alongside the Huddersfield Narrow Canal, 142 036 is the rear unit of two, working 2M61, the 09:15 Northern service from Huddersfield to Manchester Victoria, as seen from the rear cab of 185 108. 09:32½, Sunday 7th May 2017. Digital Image No. IGMP26394.